Once you have extended an offer of employment to an applicant and the applicant has accepted, you will need to close the search. 1. Login to PeopleAdmin (employment.unl.edu/hr) and open your requisition. 2. Under Take Action on Posting, select Move to Closed. 3. Select the Applicants tab. 4. Open More Search Options and make sure both active and inactive applicants are selected. 5. 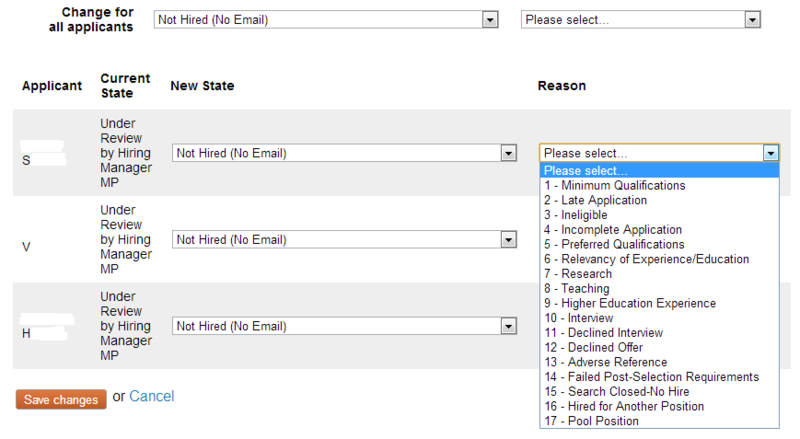 Select the applicants you are not hiring by checking the box to the left of their names. Click Actions above the applicant list and select Move in Workflow. 6. 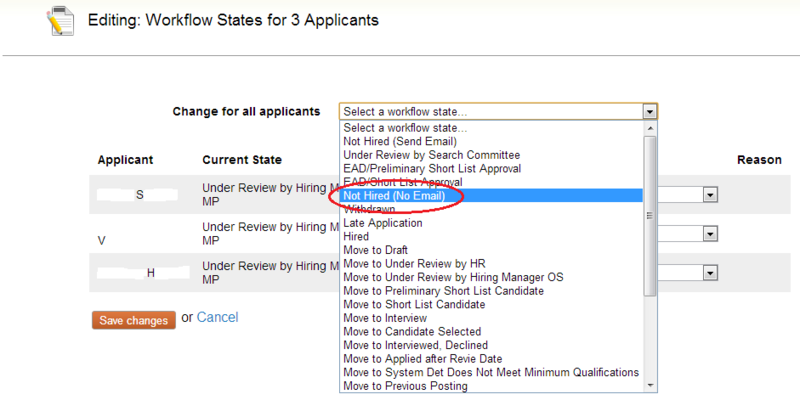 In the Change For All Applicants dropdown list, select Not Hired (No Email). 7. You will then need to select a reason each applicant was not hired. Save your changes. 8. Repeat steps 5 and 6 for the applicant who will be hired, selecting Hired from the Change for All Applicants box. Save your changes. 9. On the Summary page, select Edit (near the job title). 10. Select Post Hire Details from the menu at the left. 11. Once you have filled in all of the information for the post hire details and saved your work, return to the Summary page of your requisition. Under Take Action On Posting, select Filled (move to Filled).